Hi All! So, last Thursday night while I was typing a message to one of my favorite authors telling her all the reasons why I LOVE her new extended length novella, my computer suddenly crashed. Let me tell you, seeing that blue screen of (possible) death is NOT a good feeling! Friday morning, I carted my beloved laptop off to the Geek Squad then spent the next several days holding my breath...and wondering what to do in a laptop-less world. It's amazing - and kind of scary - how attached we become to our electronics, isn't it? My computer is now home (yay!) and I'm feeling considerably less stressed. I'll be spending today bringing it back up to speed (lost all my passwords and a few apps but, thankfully, all files and photos are intact) and working on some reviews. While I was offline I did more work on cleaning out my office. You all know what that means, right? More books to give away! So, here goes. That novella I was reading last week? 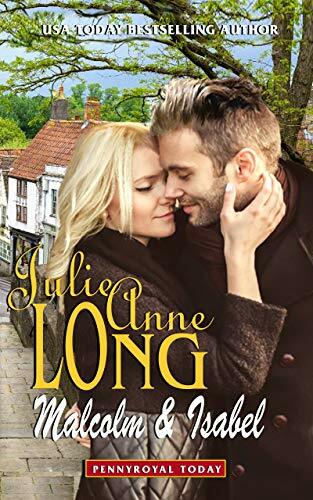 It's Malcolm & Isabel (Pennyroyal Today), a present-day story that was begun in the epilogue of The Legend of Lyon Redmond, the fabulous, final book in Julie Anne Long's historical Pennyroyal Green series. As soon as I read that epilogue three years ago, I emailed the author and begged her to write a full story for Isabel and Malcolm. She had brought them to vivid life in just a few pages and I couldn't wait to read more. I had to wait a while but, oh, that wait was so worth it! I adored these characters, fell in love with Pennyroyal of the present just as much as I had the Pennyroyal Green of the past and was beyond delighted to meet descendants of the characters I had come to know and love in Long's historical romance series. I'm now begging her for more present-day stories for the (very intriguing) secondary characters you'll meet in Malcolm & Isabel. The novella (which at 145 pages is longer than the typical novella) will be released October 15 and is currently available for pre-order. I've already read it three times. Yes, I really did love it that much. Have you read Julie Anne Long's Pennyroyal Green series? If you did, which book was your favorite? What favorite historical romance series would you like to see brought into present-day stories? Julie Ann Long's Pennyroyal series is captivating. My favorite is The Legend of Lyon Redmond. Simply wonderful and very special. Simply Wilde by Eloisa James would be lovely in present day. Sorry about your computer. I can really empthasize. Glad it is fixed. I don't usually read historicals so cannot say what one I would like to go contemp. And Have not read this series. Would love to win a pack of books, tho'. Historicals transport me to another era, place, realm and life. Historicals are meaningful and memorable. When I read historicals I become part of the locale and period. My ultimate favorite historical series is The Edenville Series. I loved the Pennyroyal Green series. My very favorite was What I Did for a Duke. I am not sure what historical series I would like to see continue as contemporaries. It might be hard to translate the "magic" to modern times. Maybe the Bridgertons. I can see Julia Quinn using her well-known wit to write a contemporary. I did not all of the Pennyroyal series and I don't have a clear favorite. But I am a fan of the author's writing. It is wonderful to lose oneself in the wit, humor, and wonderful romance of her stories. You pose an interesting question in what historical series to bring to modern day. I am not so creative to be able to imagine it, I'm afraid. As for your computer issue, that must have been awful. Reminds me that I have not backed up in a while. Will be working on that today. I haven't read Pennyroyal Green series yet, but I have a couple in my tbr pile (I need to get a few more to start the series at the beginning). I Hate computer problems - they promote them as 'turn on & go' but even when I don't change things (like adding new apps) things can go wacky. I've read all of the Pennyroyal Green series. I really can't pick a favorite as I enjoyed every single one of them. Sorry to hear about your computer crashing. There's nothing worse than that happening and fearing that you will lose everything on it. I've had it happen to me twice. I've only read two and loved them both. Oh this is such wonderful news! I absolutely loved the Pennyroyal Green series and am excited to get this modern-day addition to it. My favorite from the series was the last book, The Legend of Lyon Redmond...I absolutely LOVED that book! I have a weakness for series featuring families, with this one and Quinn’s Bridgertons being my favorites! So excited to hear that Quinn’s will be coming to the small screen!! Another new to me series. I hope that you realize that eventually, I am going to be killed when my TBR pile topples over on me. And it will be your responsibility. I have not read this series. Would like to see Lorraine Heath's cowboy series books brought into the modern times. I read It Started with a Scandal and enjoyed it. The wounded hero and Beauty and The Beast are my favorite tropes. The gentle, loving heroine who sees through the gruffness and heals his heart are a good and enjoyable combination. Obviously they are my favorite, but I have a couple more books in the series on my TBR shelf. I think I would like to see the Maiden Lane series by Elizabeth Hoyt brought into a contemporary setting. Sorry about your computer. Glad it's fixed now. I've read about 6 or 7 of JAL Pennyroyal Green series. Of the books I've read, I liked The Perils of Pleasure best. I found most of the books rather mediocre and didn't acquire the rest of the series. I would like to see The Cynsters series by Stephanie Laurens brought into at least the early 20th century if not the 21st century. Those books are some of my all-time favorite reads. Another series that would translate well to modern times are The Bridgerton's by Julie Quinn. Wonderful stories. The Cynsters by Stephenie Laurens. It's a great series. Oooh, this sounds fun! I have not read the Pennyroyal Green series, but now I would like to! I'm adding it to my list and I'm off to the library!! Glad you computer is back and running. I know how annoying it being down can be. I would like to see Jillian Hunter's Boscastle family brought into the present century.